Gregory O’Brien is the 2015 Stout Memorial Fellow at the Stout Research Centre, Victoria University, where he is currently working on a book about poetry, painting and the environment. His new collection of poems is Whale Years (Auckland University Press). He has published numerous books of fiction, non-fiction and poetry. 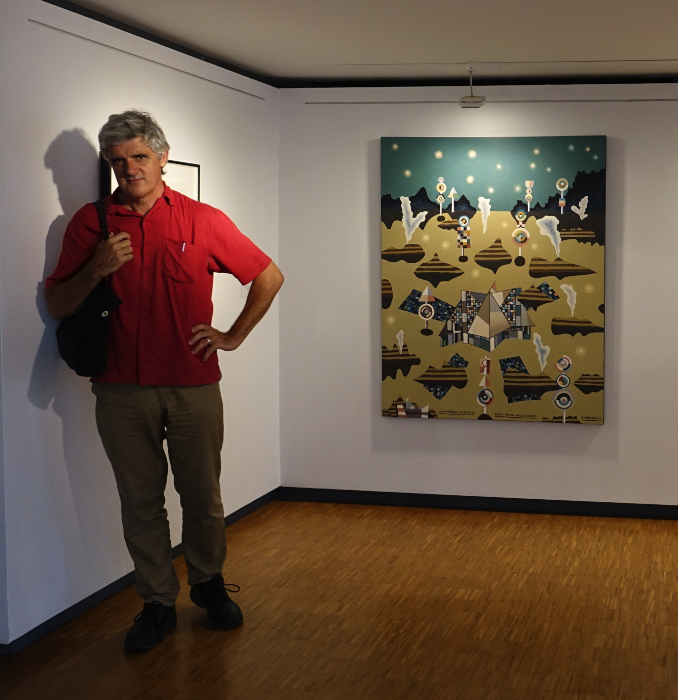 Since 2011 he has contributed to the ongoing Kermadec art project, works from which are on show at the Tjibaou Cultural Centre, New Caledonia, until July. Did your childhood shape you as a poet? What did you like to read? Did you write as a child? As far as I can recall, I drew more than I painted. And I always gravitated towards illustrated books—Tove Jansson’s ‘Moomin’ books stand out, and I remember The Lord of the Rings, as much for its illuminated maps as for the words. I went through a phase of reading comics—Whizzer & Chips rather than Batman. I date my interest in the interplay of words and visual images to those early encounters. I doodled at every available opportunity and I remember being hauled out of class and punished for drawing, rather well, a crouching deer on the inside cover of my maths book. I usually captioned my drawings—so maybe those captions could be thought of as my first writings. Occasionally I filled in speech- or thought-balloons above various life-forms. Did university life transform your poetry writing? Theoretical impulses, research discoveries, peers? I was six years out of school by the time I finished my BA, so my university life was mixed in, very much, with everything else that was going on: with 15 months in Dargaville, a year or so in Sydney… At university, I certainly wasn’t drawn to theory except in so far as I thought it was a grand imaginative game that might, periodically, yield unpredictable and outlandish results. I enjoyed the pottiness of Ezra Pound’s literary (rather than his political) theorising… An ABC of Reading is a great book. Probably the Zen-inclined John Cage and the Trappist Thomas Merton were the two non-fiction writers I held closest to me. Reading your poetry makes me want to write. I love the way your poems delve deep into the world, surprisingly, thoughtfully yet never let go of the music of the line. Words overlap and loop and echo. There is an infectious joy of language at work. What are key things for you when you write a poem? I listen to a lot of music. I want the poems to have something of the music that I love. I spend a lot of my time looking at art. And I want my poems to have something of the art that I love. There are aspects of composition, tone, rhythm and character which span all these different creative modes. Those are the key factors for me when I write… At a certain point, an appropriate form makes itself known…. The poem has to dive down into and surface from some essential state of being… There is certainly a joy in doing the things that you love; so there’s joy in the making and, preceding that, in the state of being that leads to the making…. Do you see yourself as a philosophical poet? Almost Zen-like at times? My concept of philosophy is broad and shambolic enough to accommodate what I do as a writer. I’ve never read extensively in the field of Zen (apart from the books of John Cage and the writing of my friend Richard von Sturmer). I’ve read a little, and somewhat randomly, in the field of non-conformist Catholic thought: Simone Weill, Meister Eckhart, Merton, Baxter… These peregrinations may have affected me more than I realise or am prepared to say. I guess writing has to evolve – otherwise it will become predictable and a total drag. I’m as entranced as I ever was with the process, the business, the labour of it. At the same time, I remain devoted to the finished form of it: The printed book, with its covers and half-title and title-page; and the shapes of words on the page and maybe illustrations. Poetry is an art that, if it’s working, is constantly reinventing itself. I look back at my early poems and find fault. I find myself blaming an over-voracious intake of French Surrealism; too much Kenneth Patchen one year, too much Stevie Smith the next… Too much John Berryman! And, next year, not enough John Berryman! But the ship sails on, and finds new oceans to ply. You write in a variety of genres (poetry, non-fiction, critical writing). Do they seep into each other? Your critical writing offers the reader a freshness of vision and appraisal – not just at the level of ideas but the way you present those ideas, lucidly, almost poetically. Does one genre have a particular grip on you as a writer? I’m only starting to realise the inter-relatedness of these different genres. A few years back I started to explore poetry’s potential to carry information, also to elaborate upon a thought in a more detailed kind of way, ie. to have an almost essayistic function. So quite a few of my longer poems (some of the odes and, particularly, ‘Memory of a fish’ in my new book) are laden with facts, figures and reasonably clearly articulated information. Needless to say poetry infuses the writing I produce in relation to the visual arts. I find looking at art exciting; it appeals to my poetic self. I don’t really have a critical self. I hope my non-fiction writing has a cadence, a music and a subconscious (rather than a conscious) purposefulness. Pondering my recent writings on artists such as Pat Hanly, Barry Brickell and Michael Hight, I remember in each case hearing a note—a song, almost—in my ear, and I was beholden to it. Do you think we have a history of thinking and writing about the process of poetry? Any examples that sparked you? James K. Baxter wrote wonderfully about writing poetry. Bill Manhire’s Doubtful Sounds is an immensely useful and energising book. 99 Ways Into New Zealand Poetry is terrific too. I refer back to my set of the journal ISLANDS and, yes, it seems to me we New Zealanders have been writing about the process as well as the product. Janet Frame’s oeuvre might be our greatest, most enduring instance of writing about writing, thinking about writing, writing about thinking, and thinking about thinking. Your poetry discussions with Kim Hill are terrific. The entries points into a book are paramount; the way you delight in what a poem can do. What is important for you when you review a book? I think a book has to become part of your life to really make an impression. It’s the same with music or visual arts. It can’t be a purely intellectual thing, it has to take you over, to some degree. It has to be disarming. Accordingly I tend not to discuss books that don’t ‘do it’ for me. Life’s too short. Fortunately, I have catholic tastes. There are things I enjoy very much in Kevin Ireland, as there are things I enjoy in Michele Leggott. I guess this makes me a lucky guy. I agree wholeheartedly. I am not interesting in reviewing books on Poetry Shelf unless they have caught me, stalled me (for good reasons!). What poets have mattered to you over the past year? Some may have mattered as a reader and others may have been crucial in your development as a writer? Two years ago I went to Paris and met up with one of my all-time heroes, the French poet and art-writer Yves Bonnefoy. He turned 90 last year (Joyeux anniversaire, Yves!) During my recent travels around the Pacific (from New Caledonia to Chile), I’ve taken bilingual editions of Yves with me everywhere. I am interested in the way he has turned the creative conundrum of being an Art Writer and a Poet into something unified and compelling (channelling earlier French poet-art-writers from Baudelaire to Apollinaire, with a nod to Yves’s near-contemporaries, that wondrous group of wanna-be French-art-poets, John Ashbery and the New Yorkers). I also took the poems of Neruda and Borges with me everywhere I went. New Zealand poetry is interesting at the moment. It’s all over the place. As it should be. There are plenty of people I read voraciously. As well as the poets mentioned already: Anna Jackson, Vince O’Sullivan, you Paula, Lynn Davidson, Kate Camp, Geoff Cochrane… Last year I edited a weekly column for the Best American Poets website—that was a good chance to ‘play favourites’, as Kim Hill would say. (All those posts are archived here: http://blog.bestamericanpoetry.com/the_best_american_poetry/new-zealand/) There are some great first books appearing at the moment: Leilani Tamu’s The Art of Excavation; John Dennison’s Otherwise. This bodes very well indeed. Name three NZ poetry books that you have loved recently. I was rereading Riemke Ensing’s Topographies (with Nigel Brown’s illustrations) the other day; I found that book very inspiring when it appeared way back in 1984. Lately I’ve also been reading Bob Orr’s crystalline Odysseus in Woolloomooloo and Peter Bland’s Collected Poems… I could go on. Your new collection, Whale Years, satisfies on so many levels. These new poems offer a glorious tribute to the sea; to the South Pacific routes you have travelled. What discoveries did you make about poetry as you wrote? The world? Interior or external? The Kermadec voyage, and subsequent travels—most recently to New Caledonia—opened up a huge areas of subjective experience as well as of human and natural history. How do you write about that kind of space, that energy, that life-force? Wherever you travel, the air is different; the ‘night’ has a different character; the smells and textures of the vast Pacific vary from place to place. And people move differently wherever you go – they claim a different kind of space within the environment. My recent travels have been like a door opened on a new world. The last three years of my poetry-writing have been the most intense since I was in my early twenties. That shows in this book Greg. I am looking forward to reviewing it because it touched a chord in so many ways. I love the idea that poems become little acts of homage. What difficulties did you have as traveller transforming ‘elsewhere’ into poetry? To what degree do you navigate poetry/other place as trespasser, tourist, interloper? The artist Robin White likes to point out that there is only one ocean on earth. All our oceans are joined together—it’s the same body of water. So, if you take the sea to be your home (which, as Oceanians, believe it or not, we should do), then as long as you’re at sea you’re still, to some degree, in your home environment. I feel that, as a poet, I am most in my element when I am sitting on the ground and learning new things. When the field of the known has been tilted. And filling my notebooks with various tracings of that new knowledge or sensation. This is a good way to look poetry that takes hold of you; it ‘tilts’ you. I also loved the elasticity of your language – the way a single word ripples throughout a poem gleaning new connections and possibilities. Or the way words backtrack and loop. At times I felt a whiff of Bill Manhire, at others Gertrude Stein. Yet a poem by Gregory O’Brien is idiosyncratic. Are there poets you feel in debt to in terms of the use of language? The long poem, ‘Memory of a fish’, is the piece that connects various experiences from the three year period in which the book was written, and brings them together—in an essayistic fashion, almost. I enjoy the ebb and flow of the triplets, and the world’s details tripping along them, like things washing ashore on Oneraki Beach… When I was writing that poem I felt I was living inside it, totally. And I haven’t quite climbed out of it yet, to be honest. The book also demonstrates that eclectic field you plunge into as a reader with its preface quotes. What areas are you drawn into at the moment? Any astonishing finds? The quotations at the beginning of the three sections of the book are constellations in the night sky above the poetry-ground. They mark points of reference, further co-ordinates, which have guided the writing: W. S. Graham’s ‘The stones roll out to shelter in the sea.’ The Flemish proverb: ‘Don’t let the herring swim over your head.’ Those are verbal artefacts I have carried around with me, much as you would pick up a shell or a colourful leaf. They were/are talismans. So I have stored them inside the book as well. Cherished things. ‘Constellation’ is perfect. I was thinking underground roots that nourish. 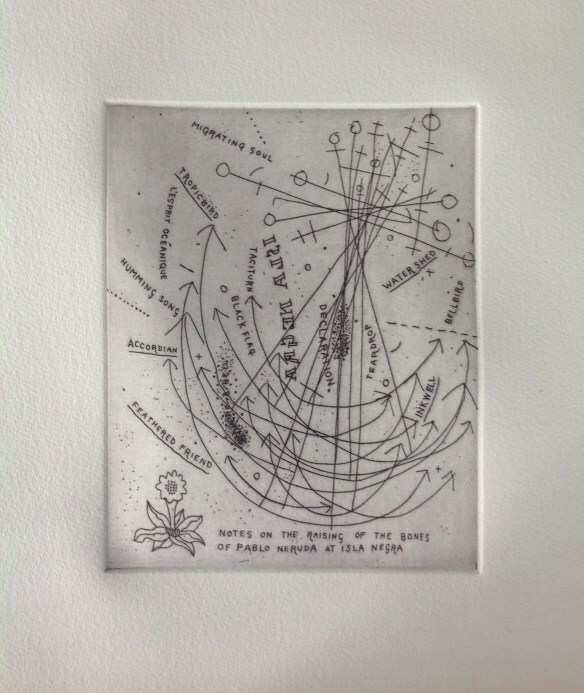 Or one of any number of maps you can lay over the poems (the map of domestic intrusion, the map of childhood, the map of objects, the map of reading). But yes the process of writing has its constellation-guides as you venture into and from both dark and light. Poetry finds its way into a number of your paintings (as it does with John Pule). There are a number of drawings included in the book that add a delicious visual layer. How do you negotiate the relationship between painting and poetry? Does one matter more? Do they feed off each other? You have collaborated with a number of other artists and writers. What have been the joys and pitfalls of collaboration? There are no pitfalls, as far as I can see. Somehow, I’ve found my way into a few collaborative circumstances and very much enjoyed the results. 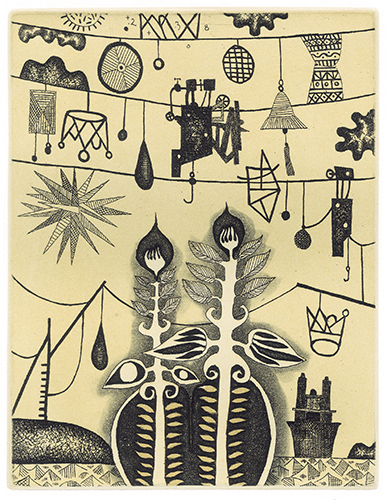 In the past year I’ve made etchings with my two painter-friends John Reynolds and John Pule. Like Charles Baudelaire and Frank O’Hara before me, I seem to have been lucky enough to fall in with a good crowd of painters (and also photographers—but that’s another story). Certainly my recent travels around the Pacific have been hugely enriching. I’m not a proper swimmer, but since I was a child I have had a great passion for floating in, or being upon salt water. (My book News of the Swimmer Reaches Shore grew out of that propensity.) The everydayness of existence is the most enriching thing—as the poems of Horace and Neruda and Wedde keep reminding me. What a great and pleasant swarm of information and sensation we find ourselves amidst, every day of our lives. I keep coming back to the Collected Poems of James K. Baxter. Not because it’s the best book ever written but because of the simple fact that it occupies a huge and resonant place in my life. This entry was posted in NZ poetry, NZ Poets, Poetry and tagged Anna Jackson, Bill Manhire, Bob Orr, geoff Cochrane, Gregory O'Brien, Ian Wedde, James K Baxter, Janet Frame, John Dennison, Kate Camp, Kevin Ireland, Leilani Tamu, Lynn Davidson, Michele Leggott, NZ poetry interview, Peter Bland, poetry interview, riemke ensing, Vincent O'Sullivan on March 14, 2015 by Paula Green. Harry Ricketts has written over twenty-five books, and while poetry is a primary love, he also writes in other genres. These include literary biography (The Unforgiving Minute and Strange Meetings:The Poets of the Great War), personal essays (How to Live Elsewhere and How to Catch a Cricket Match), and has co-edited a number of New Zealand poetry anthologies (including Spirit in a Strange Land, The Awa Book of Sports Writing and 99 Ways into NZ Poetry). 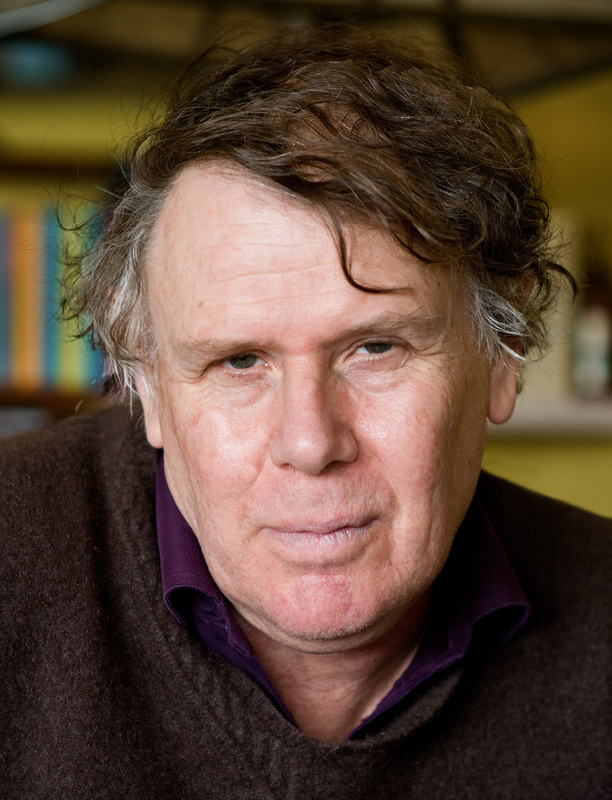 He teaches English Literature and creative writing at Victoria University of Wellington. 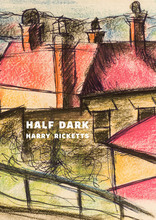 Half Dark (Victoria University Press, 2015) is Harry’s tenth collection of poems. To celebrate this new book, he recently answered some questions for Poetry Shelf. My yo-yoing childhood certainly shaped me as a person. My father was in the British army, and we moved every couple of years. This has made me see everything as temporary, provisional, also to think of the present as the moving edge of the past. I read novels, the longer the better: Rosemary Sutcliff, Arthur Ransome, C S Lewis, Tolkien, Conan Doyle ‒ and endless comics. Not much poetry, though at school we had to learn poems by heart: “The Highwayman”, “Cargoes”, “Gunga Din”. They had good thumping rhythms which, together with the rhyme, made them easy to memorise. We then had to stand up and recite them in class – quite an ordeal. I still remember some of those poems and others that ‘sing in the head’, and I’m sure that contributes to my enjoyment of poets like James Fenton and Derek Mahon who use metre and rhyme much more subtly. I remember once we had to write a poem for homework. The title and subject were up to us. My effort was feeble: rhymed, of course, complete doggerel – in every sense, it was even about our dog. But one of the other boys was asked to read his poem out loud in front of the class – a great mark of favour. All I can remember about his poem is that it contained the phrase “curly kale”. And that alliterative phrase, so simple, visual and exact, has always stayed with me. Also the sudden feeling I had when he read it out: a mixture of excitement and envy. I knew that he had somehow managed to pull off something quite beyond me, but which I now felt might be possible. But mostly from the age of eight I was mad about cricket. I started writing poems when I was sixteen. I still thought poems had to rhyme and be metrical, and felt very daring when, trying to copy T S Eliot (whom we were studying), I wrote in what I thought was free verse. I did read quite a lot of poetry: poets were we studying like Wordsworth and T S Eliot, but also Ezra Pound, Wilfred Owen, and Holub and Cavafy (in the Penguin translations that were popular at the time). I particularly liked Cavafy and tried to imitate him. Did university life (as a student) transform your poetry writing? What kind of discoveries did you make? Personally university wasn’t helpful as far as writing poetry went, though I came out knowing a bit about a lot of English poetry from the Anglo-Saxon “Seafarer” to Spenser to Marvell to Gray to Byron to Browning to W H Auden. Nothing contemporary – in fact, nothing post-WW2. We had to write weekly essays – last week Wordsworth, this week Coleridge, next week Keats. It was like a whistle–stop tour of poetry’s greatest hits – wonderful in a way, but also intimidating. Sometimes I felt I was turning into a dial-a-quote. I do remember reading some Sylvia Plath which was edgily thrilling and liking Roger McGough and Adrian Mitchell because they were funny and expressed political opinions I agreed with. I bought and read Ted Hughes’s Crow when it came out. I don’t think I ‘got’ the poems at all, but I enjoyed their dark laughter (though I wouldn’t have put it like that). This was the time when Gormenghast and Catch–22 were obligatory reading, and Bergman’s Seventh Seal and Godard obligatory viewing. We all said things like “really weird”, “far out” and “freaky”. We were terrified of being normal or at least being thought normal. It had a lot to do with the music we were obsessively listening to: Dylan, the Doors, the Stones, the Velvet Underground, Pink Floyd, later Steely Dan. Each new album was like a bulletin from another, more exciting world. We wanted our lives to be like those songs – “Strange days have found us”; “Remember what the dormouse said” – and fantasised that they were. It was very heady, and I don’t regret it, but it didn’t lead to me writing any halfway decent poems, though I did eventually write some lyrics for songs. What about as a lecturer? I think initially being a university teacher was another inhibiter because I only ever taught poems from earlier centuries ‒ often wonderful but not much help (at least in any direct way) with trying to write my own poems. More helpful was the only poetry writing course I’ve attended. This was a two–day affair in 1979, I think, at the Lancaster Arts Festival, run by a poet called Gavin Ewart. He was a playful-serious poet, who, like Auden, used poetic form as a starter-motor and could do everything from villanelles to clerihews, from prose poems to McGonagallesque doggerel. His poems were (are) clever, also often funny (a rare gift in poetry). The workshop was memorable. The first day Ewart got us to write haiku and limericks and one–line poems, and one man soon got stroppy and said this wasn’t poetry and that only the rather pretty girl with black hair was producing anything remotely interesting and then he stormed out – never to return. Personally I found trying to do the forms useful and helpful, partly because it got me away from Romantic ideas of the muse having to strike – I was still very hung up on Wordsworth and Keats and notions of the creative mood, sometimes ‘suitably enhanced’. And I do think the class generally encouraged me to be less earnest, that play was okay. The second day we workshopped poems we’d sent in advance and that was helpful. Ewart was very hot on line-endings and about not being lazy with rhyme (if you used it): every word had to pay its way. I was teaching in Leicester at the time and, partly as a result of the workshop, I joined a small group of local poets. We’d meet and discuss our work, but it all tended to be too polite, and when one member won quite a big national prize, the group combusted from envy. But I do think of that as the time when I slowly started to take writing poems more seriously. This coincided with having children, and I’d blue-tack drafts of my poems to the walls and think about them as I walked around at night, holding wakeful babies. Sometimes the poems were about my children (I had step–children too), and I think becoming a parent not only made a huge difference to me as a person but gradually also to the poems I was beginning to write. It’s not a coincidence that the first poem of mine I think is any good – “Your Secret Life” written in my mid–thirties – is about my (then six-year-old) daughter and imagining her as a teenager. Some people want to let their poems speak for themselves while others are happy to offer provisional entry points. What do you think your role is when you ‘teach’ poetry? I think if you’re giving a reading, it’s a good idea to say something between poems, offer an entry point, but not so as to swamp the poem. It is hard to listen to poem after poem without a break, particularly if you haven’t read or heard them before. (I have been to readings like this.) Teaching others to write poems or at least trying to help them is a different matter. It’s not your poem, so your role is more like that of a facilitator or midwife, perhaps. Sometimes your own experience can be helpful, but it’s mostly attention and encouragement. And urging them to read as much poetry as possible. Another terrific example of poetic entry points that work is your book on the war poets (Strange Meetings: The Poets of the Great War). To me it was scholarly yet satisfyingly fresh in its approach. Your book opens rather than closes the experience of reading these writers. What did you hope to achieve with this book? That’s very kind of you. I wanted to write a book that demythologised those WWI poets and restored them to a sympathetic human scale, something closer to the people who actually wrote the poems, who together with the horror of the war, had friendships, fallings-out, tried to find a language adequate to their experience. We wrote 99 Ways into NZ Poetry together a few years ago. Writing the book was a way of viewing the poetry landscape in new lights for me. What discoveries did you make? New lights for me, too, and many discoveries. You really helped me to read Michele Leggott, a poet I’ve always found very hard. I love the way your poems reflect shifting forms, pitch, moods, preoccupations and rhythms, yet there is always a clarity of line, a sharpness of detail, the essential moment. What are key things for you when you write a poem? That’s difficult to answer. Sometimes I’ll deliberately try to write a poem about some event, occasion or person. More usually, I’ll be doing something else altogether ‒ like writing this for you now ‒ and a word or phrase or maybe a memory will suddenly press itself on me, and I’ll find it prompts a line or another phrase and a sense of excitement. Often things just switch off; nothing more happens. But sometimes I have to keep coming back to it (whatever it is) and have to fiddle away, try this, try that. That’s the best part, don’t you think, being inside a new poem? Nothing better. When it’s finished, or as finished as it can be, you’re back in the cold again. I like that idea — the best bit is when you are inside the poem. Really, your heart starts beating faster. The outside world fades to black (or light). Harry, you have lived both in New Zealand and Britain (like Peter Bland), but I don’t find a relentless niggling tension between here and there in your poems. It is as though a poem steered by you can lay its roots in either place. Are your poems a way of forging home? Laying roots? Being elsewhere? That’s very perceptive. Temporary roots, anyway. I think the ricocheting childhood thing. I do think that not quite belonging to where you live can be an advantage to a writer. I agree. Do you think your writing has changed over time? Yes, I’m not so inhibited, not so hung-up about perfection, more prepared to try things. Prompted by Eleanor Catton, this question: Do you think we have a history of thinking and writing about the process of writing poetry in New Zealand? Any examples that sparked you? Have you done this? Well, there are poets who have written about this (Allen Curnow, James K Baxter, Michele Leggott, Bill Manhire among others). But I think there is a fairly general distrust of seeming to proselytise or sound too arty or up-yourself. Some cultures (France, America) seem to be able to talk about the arts (including poetry) more naturally or with less inhibition. But the rise of creative writing schools has definitely increased some writers’/poets’ ability, and desire, to talk about process. It’s a question as to whether this will help to produce better work. Good if it does, but writers sometimes, even often, write best when they break their own precepts. What poets have mattered to you over the past year? Some may have mattered as a reader and others may have been crucial as a writer. The Irish poet Derek Mahon and Auden always matter to me. I constantly read and reread them, and learn from them. What international poets are you drawn to? The American poet Mary Ruefle has been a belated discovery. She is a fabulous discovery for me too! I feel like I want to secretly do some MR poems and see what happens. Particularly the white-out pages. 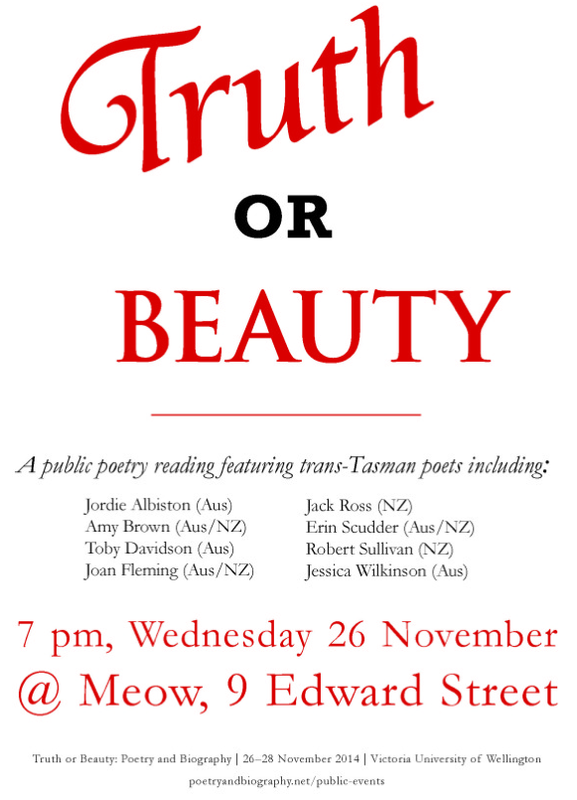 What New Zealand poets are you drawn to now? In the last year or two? Fleur Adcock’s last two collections ‒ terrific. Ian Wedde’s recent poems. Ian’s The Commonplace Odes would have to be one of my top NZ picks. Name three NZ poetry books that you have loved. Jenny Bornholdt’s The Rocky Shore. James Brown’s Lemon. Bill Sewell’s Ballad of Fifty-one. You write in a variety of genres (poetry, non-fiction, critical writing). Do they seep into each other? Does one have a particular grip on you as a writer? Yes and no, but poetry is the thing. Poems that presuppose a trust they haven’t earned. I was drawn to the title of your new collection (Half Dark) because for me it signals the way poems emerge from and move in and out of the shadows (as opposed to a glass is half full kind of thing). Why this title? It’s a phrase in one of the poems. As you say, it suggests movement in and out of shadows. It also suggests the mood and tone of many of the poems. These new poems are like a steaming road with heart, memory, ideas, anecdote, sights rising up and simmering above the surface— poems that steam with life and possibilities. For me this is one of your best books yet. What discoveries did you make about poetry as you wrote? The world? Yourself? One discovery, as I’ve explained in a note in the collection, was about a form called the triolet. I’d never imagined trying this short form with repeated lines, had shared a fairly common sense of superiority towards the form. But an Australian poet-friend Cath Vidler confessed to having become addicted to the form and suggested I try it. I found she was right; it is addictive. More interestingly, I discovered that though usually used for light verse (which is fine, ‘light’ doesn’t have to mean ‘slight’) in fact you can use the triolet for serious, even heart-breaking, subjects. It’s much more flexible than it looks. And, as poets have done with the sonnet and other rhyming forms, you can empty out the rhyme and just keep the shadowy shape. Discoveries about the world? Well, with the death of friends and family, my world is getting colder, half-dark. I love your triolets– reading them prompted me to write one myself. I can see why they are addictive. There is a honeyed overlap of repetition and within that echo the subtle nuance of difference. Nuances steered by shifting juxtapositions. Is there a single poem or two in the collection that particularly resonates with you? The last poem, “About”, means a lot to me. I started it in 1980 and it’s changed over the years as I have, and I kept losing it and then finding it again. “Noddy” (about a dead university friend) brings him strongly to mind. I love the blurb on this book. First it references your poem about the phrase ‘Mind the gap’ from the London Underground (that has haunted me too!) and then it introduces the collection as one that ‘addresses the people and places that fill a life and the gaps they leave behind.’ Gaps are so crucial in poems. For me, this entry point heightens my response to your poems. Tell me about the role of gap in this new collection. Indeed. Is doubt a key part of the writing process along with an elusive horizon of where/when you are satisfied with a poem? Yes, doubt is key. Also gratitude. Rules are to be broken, but it’s worth knowing what they are first. Personally I don’t end lines with words like ‘a’, ‘the’ ‘in’ or ‘of’, unless there is a really good reason. A bit of all of these. W H Auden’s Collected Poems. This entry was posted in NZ Poets, Poetry and tagged Harry Ricketts, NZ poetry interview, Victoria University Press on March 5, 2015 by Paula Green. 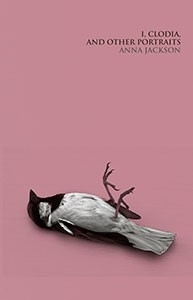 A book-length poem is no easy feat, and Zarah Butcher-McGunnigle has achieved this coup magnificently in Autobiography of a Marguerite, creating a visceral and emotionally sparky long poem haunted and stalked and befriended by a host of Marguerites as well as other identities shaped by illness, crumbling and strikingly intimate family relationships, and language in which the adults’ voices break like teenagers, while the ‘young people’ make a note to have more snacks in their bedrooms to survive the strange new flow of time. Rachel O’Neill [RO]: Who was the first Marguerite? Did any of the Marguerites beget a Marguerite? 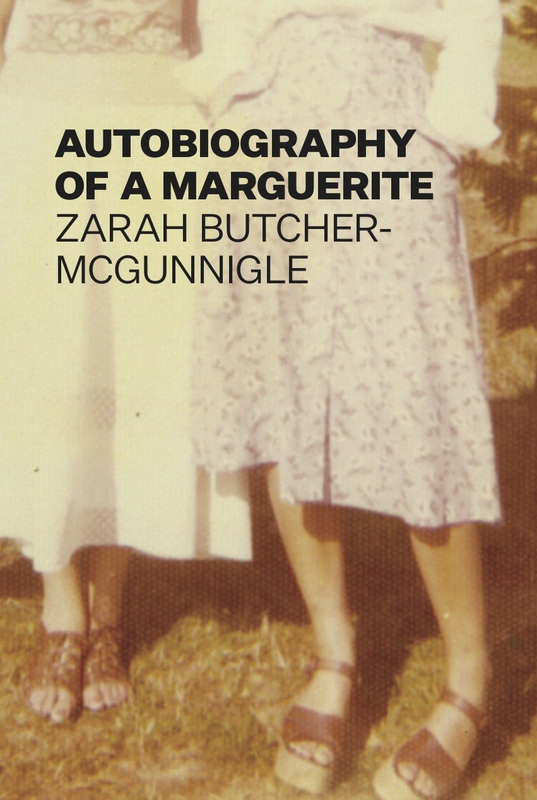 Zarah Butcher-McGunnigle [Z B-M]: The first Marguerite was a thirteen year old who sat in front of my grandmother at school. My grandmother admired the girl’s blue eyes and black hair, and she said to herself that when she was older she was going to have a daughter with blue eyes and black hair and she would name her Marguerite. And, as my grandmother has told me various times, that is exactly what happened – her first child was a daughter with blue eyes and black hair, and she named her Marguerite. Coincidentally, there is a Marguerite Duras novel called Blue Eyes, Black Hair, and I used this as one of my source texts for my book. My mother is actually embarrassed about the fact that her name appears in the title of my book. When someone, like a colleague, asks her what the title of my book is, my mother says she can’t remember. [RO]: Can you describe three things that interested you about the process of putting this collection together? [Z B-M]: When I first read this question, I wrote: pain, identity, burden. Then I wrote: texture, experience, subversion, non-linearity. I was interested in working on a book-length poem or project rather than writing individual poems that I’d put together at the end in a collection. So I guess I don’t really see the book as a ‘collection’ as such. I wanted the book to be more of an experience. I was interested in autobiographical writing, but I also wanted to write poems that were more ‘language-centred’. In the early stages, my supervisor said there was too much situation, and not enough story – that I needed more structure, more narrative, and more from the outside word. So I tried to adjust the balance. I wanted the pieces to speak to each other and cumulate meaning as the book progressed, but I also had to think about ways to counter the risk of repeating or pushing too hard at certain ideas [when exploring things in long sequences]. [RO] What happens when you start to make objects and subjects out of memory? You miss out details or you put too many details in. You miss out details because you know the back story and forget that the reader doesn’t, or you put in unnecessary details because you get distracted by the memory and try to recreate or represent a particular situation, rather than focusing on a feeling. You can get lost inside the memory and become exhausted, trying to navigate it from the inside. You can decide to alter a memory and write something that isn’t ‘true,’ but then later that something can turn out to be ‘true,’ or more accurate to ‘real life’ than you thought. [RO]:Can you tell us a little about your use of footnotes in the book? Are they apertures to things outside of the main text or do they point to the holes already blistering the so-called main story? [Z B-M]: The footnotes function both as openings to things outside of the main text as well as pointing to holes in the main story. The footnotes interrupt the ‘absorptive’ flow of the confessional narrative, but their tone is more lyrical than academic or explanatory. They add another layer of time and identity. All of the footnotes come from novels by Marguerite Duras and Marguerite Yourcenar, so a Marguerite comments on the life of another Marguerite. The footnotes act as a kind of fragmented (auto)biography of the books they come from, while adding details to another redacted autobiography… and the autobiography is a story within a story. The footnotes exist in a different time space than the main text… and the narrator who is writing the autobiography put the footnotes there as part of a way of reinterpreting the past in the present, sometimes adding metaphorical details, sometimes adding self-aware notes like, ‘Cheap melodrama’. I also see the footnotes as another voice, another monologue, in the play of Marguerite’s life. Or maybe like experimental stage directions. The reader experiences both being a witness and an actor (like the narrator) because they have to participate in piecing together the main narrative text as well as welding the footnotes to the text. The form (the half-finished sentences + the footnotes) is a kind of performance of the process of remembering, and reinterpreting the past. [RO]: What draws you to reflect on moments of miscommunication and the scary moments of real understanding? [Z B-M]: Because something has to be at stake – for me as the writer, and for the reader. “‘Pain is not interesting,’ but it is.” And your whole life script can be based on a few moments of miscommunication. [RO] Does illness mean you locate yourself in time differently? And what was your motivation for giving visibility to illness in the book? [Z B-M]: I think so, yes. Because illness is a way of measuring time… (Oh, I used to swim every week back then, before I got sick… We moved here a year after I got so sick, so that must be seven years ago, now… That was the summer your father got so ill he almost died…). I’m talking about chronic illness in particular. And in my experience, you can feel both as if you’ve lost time and as though you’re stuck in time. You remain [the age you were when you were diagnosed]… you didn’t have the chance to live in a way like other people did [at that age] to have the experiences other people did, because of your illness. If you have to spend months at home resting, you can feel as if you are wasting time or losing time. And the trauma that illness may bring can also lead to not being able to remember a period of time very well, as a defence mechanism… so you look back [on your life] and you say, ok, I remember going to the hospital and I remember sitting in the lounge for a while, but I don’t know what else happened during those five months. Illness also means you locate yourself in time differently because the way you use your time and the way you view the future will most likely change. Maybe the future seems much more uncertain and frightening now that you are ill. The symptoms you have are not just concerning because they are happening right now, but because of what they mean for how your life will be from this point on. Time passes, and you are still sick, so you have to get used to it, or you have to get used to not getting used to it. Thinking and talking and writing about illness seems interesting and important to me. In particular, how illness shapes the way someone sees themselves, and how others see them. How does a person deal with their illness? How do other people react, and how does the reaction of others alter the way someone deals with their illness? Does illness become part of a performance? Is illness (socially) rewarded or punished? What value do we give illness x or y? How does it affect relationship dynamics? I guess I want people to think about these things… as well as perhaps gain more understanding and empathy for people they know with a chronic illness. It seems also important to give visibility to chronic illnesses because they are often ‘invisible’… in that there may be no physical signs apparent to friends or people on the street, and so when people do find out, they often say things like, ‘Oh, but you don’t look like someone who would have [x, y, z]…you look too young to have it!’ or ‘But you look fine! You don’t look sick… ’. Early on though, I realised I didn’t want to write about a journey of a particular illness, with all the medical details and experiences. I wanted to explore the social aspect of illness in relation to identity and family, and I wanted to use illness as a concept, to illustrate the struggle for autonomy and a sense of self, tying it in with a relationship where the daughter struggles to separate herself from her mother. And although I don’t name an illness, I do mention that it is an autoimmune illness – another detail which symbolises/highlights the struggle for a sense of self. The immune system is a boundary between you and the outside world, and the first task of the immune system is distinguishing self from non-self. Autoimmunity occurs when the immune cannot recognise what is self and non-self, and begins to attack its own tissues. In the book, it is sometimes difficult to distinguish the mother and the daughter, particularly in the second section with the footnotes. The footnotes could also be seen as a kind of autoimmune illness, attacking the main body of the text, the other Marguerites. [RO]: What was the last boring thing you did that also gave you a lot of satisfaction? [Z B-M]: Probably… responding to a couple of emails that had been in my ‘flagged’ pile for ages. Going through my inbox and flagging emails is also kind of satisfying. Zarah Butcher-McGunnigle’s work has appeared in a wide range of publications, including Hue & Cry, the publisher behind this book. 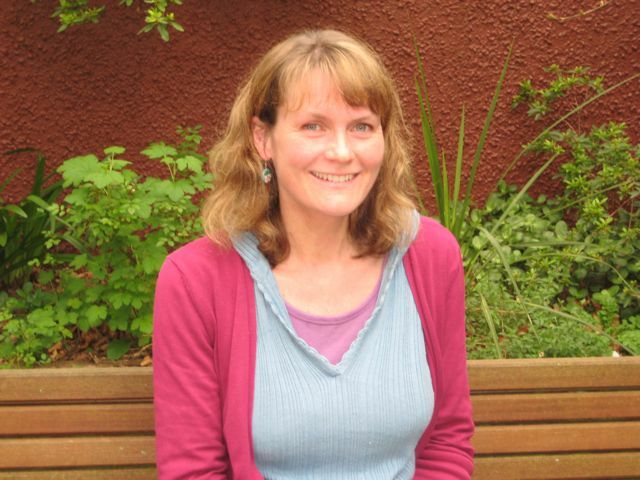 You can get a taste for her work by checking out Best New Zealand Poems 2011 and 2012 and the latest issue of Hue & Cry. She was awarded the Biggs Poetry Prize from the International Institute of Modern letters for her manuscript, the first rendition of Autobiography of a Marguerite. You can find out more about the book here or pick up a copy at the Auckland launch. Rachel O’Neill’s first book of poems One Human in Height was published by Hue & Cry Press in 2013. See Hue & Cry author page here. Paula’s review of Rachel’s debut collection here. 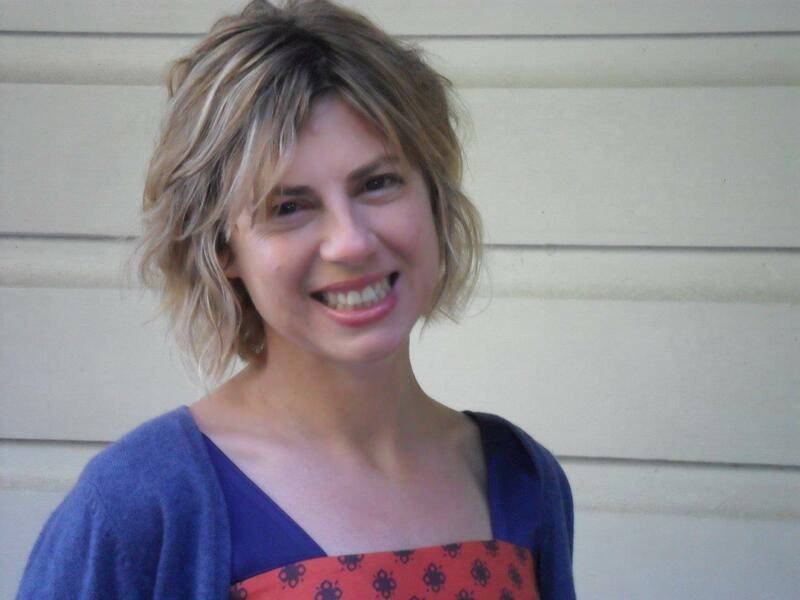 This entry was posted in Poetry and tagged Hue & Cry, NZ poet, NZ poetry interview, Rachel O'Neill, Zarah Butcher-McGunnigle on June 10, 2014 by Paula Green. This is a must-read interview that takes you deep into a frevent poetry discussion and that generates countless ideas. Wonderful! Poetry gold! Poet Joan Fleming is in conversation with Steven Toussaint and Lee Posna. Just one point: I would argue that there are a number of local poets writing against the mainstream grain here (the extraordinary Jack Ross, for a start! Alan Loney, Michele Leggott, Sam Sampson, Murray Edmond, Wystan Curnow as did Leigh Davis ). There is a thread of difficulty and/or counteraction that you can fruitfully trace in New Zealand poetry, and once you start following it, it sidetracks and takes you all manner of places and possibilities. The full interview can be found at The Lumière Reader here. This entry was posted in Poetry and tagged Joan Fleming, Lee Posna, Lumiere Reader, NZ poetry interview, Steven Toussaint on June 4, 2014 by Paula Green. Kirsti Whalen, an Auckland poet, had a terrific conversation with Wallace Chapman on National Radio this morning. I just loved hearing the Tim Finn poem again. And I loved the tribute to women poets who have preceded us, Janet Frame especially: ‘My whole high school ended up writing poetry in the vein of Janet Frame.’ Yes, we are shaped and in debt so very much to those pioneering women writers who preceded us (speaking as a woman poet here of course). There was a well deserved nod to English teacher extraordinaire, Ros Ali, too! Kirsti is currently studying at Manukau Institute with Robert Sullivan, Anne Kennedy and Eleanor Catton. She was shortlisted recently for The Sarah Broom Poetry Award. Listen to Kirsti Whalen with Wallace Chapman here. This entry was posted in Poetry and tagged Kirsti Whalen, NZ poetry interview on June 1, 2014 by Paula Green. My sister and I were surrounded by books: my mother is a voracious and rapid reader; there had to be at least weekly visits to the library for her to maintain her supply. My father used to say she couldn’t possibly be reading at that pace; she was turning the pages too fast. She was not just bookworm but book termite. She read to us often — AA Milne and Beatrix Potter when we were preschoolers — and she also actively encouraged our participation in drama lessons, and ­— at our pleading — wrote us small items to perform for family. Theatre I think also helped to attune my ear to pace, variation in tone: many of the aural aspects of language. I was a slightly shy, slightly overweight child and had started at 6 different schools before high school: books of all kinds were a refuge from the inevitable ill-fit of new-girl/plump-girl. I did write as a child. One of the ways I tried to stay in touch with a friend in Christchurch when we moved to San Diego was to send her a ‘novel’ (a few pages typed up from my wonky handwriting by my ever-patient mother) about horses. The friend and I had an ongoing imaginary game of horse-riding adventures with another friend, where we were some sort of horse and human hybrid, cantering all over the Spreydon school playground and our back gardens, and making up odd mixtures of talcum powder, perfume, grass, water and weeds at home to feed the horses…(this must have been unbeknownst to somebody’s mother: who would let kids splash perfume into buckets to feed invisible stallions?). I missed Nicola and the game so intensely that writing the story seemed a way of holding on to both friendship and game. I even tried to illustrate it, which is a woeful confession as I have the drawing skills of an eggplant. Other things I loved doing: I was a good swimmer, just about lived in the water in California, but didn’t have any interest whatsoever in competitive swimming. I loved music, but probably didn’t get lessons soon enough – or rather, had a regrettable gap of six years between recorder and clarinet. I like to fantasise that my potential fell through that gap like a necklace through a knot in the floorboards….I tried hard at clarinet, but was as average as average can be. I loved hooning around on roller skates; all the kids in my street in San Diego at one point had a grand scheme to perform Grease on wheels in the road…we practised, we choreographed; we entered school talent contests with our own dances… That sort of free, imaginative, almost wholly unsupervised play for primary school children was a lot easier in the 1970s: even, it seems, in urban California. I took various dance classes in San Diego too: Polynesian Dance; Jazz Dance; but as I said, I was an inelegant, dumpy, ordinary, slightly clumsy child – so almost everything other than swimming and reading seemed to have an element of struggle to it. When I read Hone Tuwhare as a 14- year-old, it was like discovering a new art form, even though I’d read a fair amount of narrative, nonsense, or Romantic poetry either consciously shaped for children or digestible by children — Eleanor Farjeon, Edward Lear, Kate Greenway, Walter de la Mare, John Masefield, Browning’s The Pied Piper of Hamelin… I thought I knew poetry but coming across Tuwhare’s poem ‘Rain’ in a fourth form English class felt like some fog had peeled away from the world: the very air had clarified. And then I was introduced to the poets of the Mersey Sound through an anthology I got for a class prize – and there were poems filled with humour and identifiable urban detail — fish and chip paper, denim jackets, neon lights, cups of tea, steamed up café windows, brown packing string: these poems too were a revelation. I suppose there was a transition from poetry that seemed to be set in the realm of myth and imagination to poetry that dealt with the realities I had to start confronting without the protective feather-down of family. I read Plath and TS Eliot at high school; Dylan Thomas; Cilla McQueen; Fleur Adcock; Alistair Campbell; and began to read independently over the school holidays as if it was some kind of secret vice – buying myself Faber and Faber editions of WH Auden and Wallace Stevens, more of the Penguin Modern Poets anthologies – reading them in a kind of uninformed, naïve way, trying to find that clarifying ‘hit’ again that Tuwhare and Plath had both given me. Hone had a similar effect on me. I likened it to putting on glasses for the first time. Did university life (as a student) transform your poetry writing? Theoretical impulses, research discoveries, peers? I think it did. It probably led me even further away from the fantastical and science fiction, which were genres I absolutely loved reading as an adolescent. (John Wyndham, Ray Bradbury, Maurice Gee, Ursula Le Guin, Louise Lawrence, Penelope Farmer…)Taking courses in canonical literature, and striving to do them well, left little time for exploring outside the set reading lists. Yet an honours course in Modern Poetry, which Bill Manhire taught at VUW, was as important to me as the original composition paper I did there. Bill’s work as an academic teacher is perhaps mentioned less often than his work as a creative writing mentor: he could talk about various periods in literary history with an apparently casual, contemporary language that was still incisive and vivid. It made it all seem fresh, relevant, ripe with anecdote and choice morsels of quotation. He spoke without condescension or aloofness, which then, anyway, was actually still very rare in university professors towards undergraduates: these things have immeasurable impact on a very young scholar or writer. The course in original composition taught me to try new forms, and it encouraged re-writing, rather than preciousness and weak defensiveness — the ‘Well that’s the way it really happened’ or ‘That’s just the way it came out’ bullishness that’s common in workshop situations. It encouraged stepping back from the work and testing it. It asked technical questions such as, why that tonal shift? Why that line break? Why so obscure? One of the most important things Bill said to me was about a syllabic poem, which was comparing psychological scars to physical scars, and doing so in that terribly abstruse, fraught, coded way that new writers often tackle the personal. The class went totally shtum, and Bill, who usually tried to hold back on commentary so that it was a student forum, finally said, with a serious frown, “I’ve got no idea what it means, but it sounds really good.” Everybody else in the room seemed to suddenly go limp with relief. They didn’t have to grapple with that recondite, contorted crocodile of a draft any more. That was a moment where I realised I actually might have some kind of poetic ear, but that I’d also inadvertently managed to write something that was almost purely sound, with no sense at all. When I re-read that poem now, more than 20 years on, I have no idea what some of it means either. In some ways I think the lessons from a course like that only come to fruition many years afterwards: they really are just one step in a much longer process of self-education, and learning through doing. They help to set the clock running: but the clock has to keep being wound on. I love the way your poems abound in complexity. The first delight is the delight of music, the way each poem is a miniature musical score. The second and third delights are the way your poetry engages both heart and mind at a profound level. What are key things for you when you write a poem? That’s a really generous critique. Yes, the way a poem sounds is key: though even after all these years of reading poetry and even teaching it, the rhythmic element is often done intuitively rather than according to a strict percussive rule or a classically constrained metrical scheme. But I do listen closely to pace; I think of the line break as a micro-pause; I think of white space as silence, or yes, articulate musical rests. All the other aural components are things I enjoy and crave when reading poetry: so I try to gently feed them into the work too. Jack Gilbert; Tomas Tranströmer; Alice Ostriker: Siobhan Harvey; Ian Wedde; – I’ve only just read his Lifeguard poems, and was astonished at the combination of control and tenderness; the way the dreamy refrain ‘shadow stands up…’ accrues more and more eerie power as the poem proceeds. In terms of the question who has been ‘crucial in your development as a writer’ over the past year, I’d say Michael Harlow, whose review of The Truth Garden was a turning point for me in terms of self-acceptance. Even as a 20-something, that decade which is always the decade of refining one’s public persona, of perfecting cool, whether you’re a writer, a student, a shop worker or an office clerk, I was, hmmm, temperamentally suspicious of what seemed a ubiquitous tonal irony in local poetry: of what I sometimes felt was dishonesty, or posturing, or a reserve that seems on some levels a failure to commit. There is a downbeat understatement in some contemporary poetry that very often tips over into the banal – where poets are so afraid of saying too much, or of seeming sentimental, of seeming uncool, that the default mode is a lack of affect; a ‘like, whatevs.’ I’d rather be accused of being too ornate, or ‘high octane’, or of making the emotional position of the poem too clear, rather than appear disengaged and numbed down. Harlow’s review felt like someone saying certain aesthetic risks are worth taking. I’ve been very excited by the young Joan Fleming’s work and by a young expatriate English woman, Loveday Why, who is studying at Otago and writing poetry also. These two young women seem to manage to infuse their work with an enormous amount of feeling and yet also to have technical control, an eye for a delectable oddness of imagery and phrasing, a way of bending the line and toying with syntax and white space in ways that seem psychologically expressive as much as academically or theoretically driven. I’m also intrigued by Ashleigh Young, and am keen to see what she does next. I’m struck by her prose as much as, if not more than, her poetry: she strikes me as a gifted essayist/blogger — she applies a poet’s microscopic attention to the sway of a sentence. Yes. But I want to change it again. I’ve had a phase of the poems expanding, turning into 2-3 page mullings, and now I’m longing for the cool crisp ice cube; the tequila shot rather than the rambling lunch. You write in a variety of genres (poetry, fiction, critical writing). Do they seep into each other? Does one have a particular grip on your heart as a writer? They do infuse each other. Although I write reviews I don’t claim to be a critic – I think of myself as a practitioner reading other writers closely to see what I can learn from them. I think of a critic as someone who has the full weight of academia behind them; someone, in other words, with a full-time salary and regular hours to immerse themselves. It’s something of a shock to realise people consider me mid-career. I still feel like a novice. Every book, every poem, makes me feel like a novice. That’s part of the allure, I suppose. So I’m still trying to figure out, poetry or fiction? Which is my natural habitat? As a matter of fact, the 92,000 word novel I’ve been writing on and off over the past 3 years started off as a verse novel. Then it rebelled and the lines started refusing to break as I tried to build up my own understanding of the character dynamics. I’m trying to gird every part of my anatomy to go back to it and see if I can recast the entire thing as a verse novel again. It’s like arm wrestling with a stroppy Sumo-sized toddler. Sometimes it won’t even come and sit up at the table. Poetry is so broad – this is one thing that teaching creative writing constantly reminds me. It can be narrative, epic, lyric, patterned by numbers, patterned by wildly arbitrary constraints, it can be experimental, digital, anecdotal, it can be two words on a page, or even one word on a page that highlights its own typographical components, it can have a tight rhyme scheme, it can have a rolling freight train metre, it can merge into prose and call itself a prose poem; it can have a close relationship to visual sculpture. Even that list is not exhaustive. For my own practice, the musical elements are vital. The luminous moment is vital; sometimes the poem embodies the movement towards or away from that luminous moment. I also like the idea of a poem tracing the activity of a mind as it works out just what it thinks; of a poem transcribing the very process of realisation. But as a reader, I’m open to poems that do all the things my own work can’t, as well as to those that work in the same space. In fact, it’s often more exciting to read someone whose work is vastly different from one’s own: it’s like foreign travel. You were recently The Pah Homestead Resident in Auckland. How did this new location and distance from home affect your writing? There were acres and acres of time. That was the main difference. When I had the Burns Fellowship two years ago, I still had a very young child (a two-year-old), we moved house, and the fellowship itself involved a lot of public speaking, which meant that in some ways the year was quite stressful; in addition, my normal domestic responsibilities continued. At the Pah Homestead, I could write all day every day anywhere I liked: at the dining table, in the bedroom, at the desk, on the floor, legs waving in the air like a synchronised swimmer if I wanted. No having to drop everything to attend to family needs. I got a huge amount done: I managed to finish the draft I’d started on the Burns — and I’m still immensely grateful for that opportunity. My husband should be considered one of the co-sponsors of that stint: he solo-parented for the entire three months and he did a better job than I would have on my own. I absolutely loved the solitude and it felt like truly coming home in a very deeply reassuring, even empowering way. Women writers have often had to manage a writing life along with domestic demands and have been denigrated for writing that embraces domestic concerns. 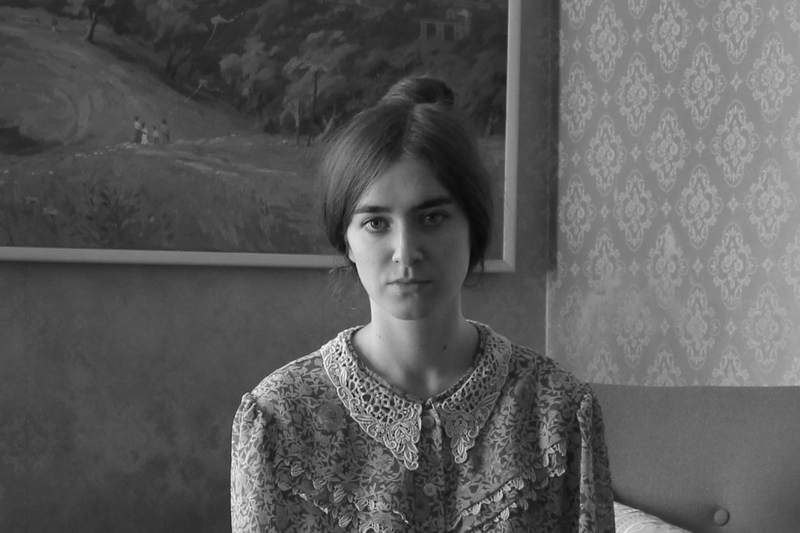 You write some of the best domestic poetry in New Zealand and I say that partly because your poems take the reader into the aching and joyous gut of family life in ways that are poetically complex, moving, haunting. Any thoughts on this? I’m less and less sure of where the domestic and the political drop hands – if ever. Sometimes the poetry comes out of a real struggle with all the roles I have to play. Sometimes the domestic is my subject because I don’t have the time to read, research and explore more arcane or erudite topics, or topics that actually interest me more than the fights over getting dressed in the morning, or where the red light sabre is, or what to cook for dinner. The psychic energy parenthood takes is enormous. I also think that another way of describing so-called domestic poetry is psychological poetry. It’s about mind, character, power dynamics, identity development, relationships, dependence, independence. Nearly every day we leave home for the world; nearly every day we come back home with the air of the world on our skin. Where does home end and the world begin? Is the ‘where’ a mythical line, an imaginary equator? Musicality; crispness; an ear for the unintended double meanings in casual speech; innovators like Anne Carson; typographical experimentation; wit; multiple meanings; psychological depth. Conversations with lively adventurous warm hearted friends, sleep, art galleries, theatre, film, teaching new young hungry energetic responsive students, conversations with my children, walking, running, looking out the window. Very important to look out the window. The line break is a marvellous invention. It should be used consciously. All three things, actually. They exhibit the best and the worst of humanity: ingenuity, the urge to connect. Yet they can be a shallow, addictive distraction, and a vehicle for spitefulness and vitriol. So I suppose they are only as good as we are. What were some of the key elements of the poems you submitted for the award? The immediate concerns of the intense ‘terrarium’ of my own small family; my ambivalence about various social movements/mind-sets or rapid technological change; anxiety about ecological crisis; the coded way dreams speak to us. I know that I’ve been working over maternal anxieties, fears and discomforts for several books now, fiction and poetry, and this subject won’t leave me alone, but I was also trying to consciously push myself to try something completely different – hence the social media poems, which have a visual/pictorial component too. I decided that my ambivalence about social media could be put to a more positive use than just a cyclical disgruntlement then attraction, and it could perhaps seed some poems instead. Definitely Wallace Stevens’ Collected Poems. I’ve owned it since I was 16, I think, and I still haven’t managed to read every single word, but I go back to it again and again. It’s a kind of atheist’s Bible: it’s technically supreme, musically audacious and exquisite, intellectually diamond cut, it offers enormous consolation, somehow, to an atheist who longs for transcendent meaning but just cannot hear a God who suffers the little lambs to come unto him. This entry was posted in Poetry, Poetry Awards and tagged Emma Neale, NZ poet, NZ poetry interview, Sarah Broom Poetry Award on May 8, 2014 by Paula Green.